How to import to Thailand? What are the import procedures in Thailand to move goods? Explain about import registration process, cargo movement to Thailand from overseas countries, Import delivery process in Thailand etc. Detail the import methodology in Thailand. 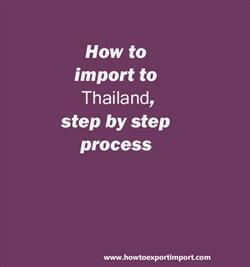 This post explains about step by step procedures that need to be finished with Thailand government authority for importation to Thailand. If you need to import goods or services, a onetime registration procedure is being completed in most of the countries. Such import export licence may be obtained from concerned government department of Thailand if required. The official customs authority of Thailand is Thai Customs. All goods exported from or imported into Thailand must be reported to the Customs department. The trader should register to use e-Customs system. For registering in this system, the importer should have a ‘digital certificate’. The digital certificate is fundamental for all organizations in Thailand with any online activities, including import and export registration. This e-Customs system provides a one-stop service for all stakeholders in cross-border trade. Procedures such as issuing licenses and paying duties and taxes have been made paperless and can be completed using the central e-Customs system. The "e-Customs" comprising of e-Import, e-Export, e-Manifest, e-Payment, and e-Warehouse. This post explains about different phases in import process that every importer needs to go through in Thailand. Information to import to LAEM CHABANG. Step by step process to import to Udon Thanig. Methods to import to Chiang Rai Province. Guidelines to import to Hat Yaii Please guide to import to Chiang Rai Province. Help to import to. Procedures required to import to SONGKHLA. Requirements to import to Bangkok. Clarifications to import to Ko Samui. How can I import to Surat Thani Province. What should I do to import to Chiang Mai. How to import to Bangkok? Formalities for import to LAEM CHABANG. Procedures to import to SONGKHLA. Need to import to Phuket Province. Explain to import to LAEM CHABANG. Mubeen Ahmed: On 27 April 2018 Dear Sir, Hope you are doing well. I am from Pakistan and i want to import Double A4 copy paper from Thailand. i need your support how i can verify that a selling manufacturer have registered company. Hope you will guid me. which compnay from i am purchasing paper is not a facke company how i can check.? i shall be very thank full to you if you guid me that how i check company registration.